From an early age, actor Jonathan Chesner knew he had the kind of brain that would wear a Hawaiian shirt, bright red pants, and cool painted shoes to a wedding while most other people's brains would wear three-piece suits. He also knew that if he learned how to manage the difficulties of ADHD and harness its awesome powers, he would help other "special brains" by sharing this knowledge in a book to slay all other books. This is that book. 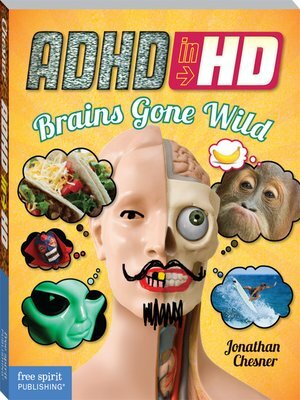 ADHD in HD: Brains Gone Wild is a kinetic collection of frank personal stories of failure and success, hilarious anecdotes, wild ideas, and point-blank advice that will resonate with teens and young adults. While most books on the topic are written to parents and educators, this is written to hold the attention of the teen and young adult ADHD reader: more than 60 short essays, interesting topics, wacky illustrations—all stamped with Jonathan's irresistible humor. The book addresses the four main characteristics of ADHD: hyperactivity, impulsivity, inattention, and indecisiveness. It provides positive advice about school, family life, social life, dating, careers, medicine, and how to be like Mr. T—even if you don't have a Mohawk, lots of gold chains, or huge muscles. Jonathan Chesner's ADHD in HD is inspiring, upbeat, and fun and gives the unique perspective that ADHD isn't all bad—it can actually be a blessing in disguise.